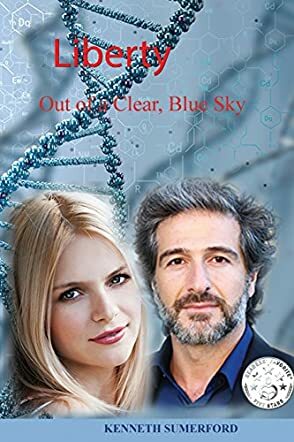 Liberty: Out of a Clear, Blue Sky by Kenneth S. Sumerford is a gorgeous story with a lot in it to rouse both the reader’s curiosity and their sense of awareness. This contemporary Christian romance explores the possibility of a love between two people whose beliefs strongly oppose each other. Meet twenty-nine-year-old Liberty, at a turning point in her life and longing for love. She meets Professor Ernest, an atheist, who doesn’t believe in life after death and in a lot that is propagated by the Christian religion. Liberty is a staunch Christian who embodies the values of the Bible. Beyond what they feel for each other and the prospects of a life together, can these two passionate souls find a common ground where their ideas can reconcile with the beating of their hearts? A difficult question! But this author has handled the dilemma in a brilliant way. It takes a lot of skill to weave an ideological conflict into a romance without coming across as having it forced into the narrative or sounding preachy, and Kenneth S. Sumerford has got that subtlety in style, crafting conversations that help develop the conflict and move the plot forward. The narrative is emotionally intense and the psychological elements of the story are well explored. Readers will enjoy the key characters and their backgrounds, but it is the confrontation between faith and reason that gives the story an intellectual quality that is both entertaining and exciting to the mind. One is left in no doubt that the novel is well researched and written with a beautiful setting. Liberty: Out of a Clear, Blue Sky is as gripping as it is entertaining.